Heat meters are used to measure heat energy distributed through a district or centralised community heating scheme. The Sharky Ultrasonic 775 heat meter can be used for heating applications up to 150°C and cooling applications from 5°C. It was the first ultrasonic heat meter to be granted EN 1434 class 2 approval and is also Measuring Instruments Directive (MID) Class 2, which makes it eligible for the Renewable Heat Incentive (RHI) scheme. 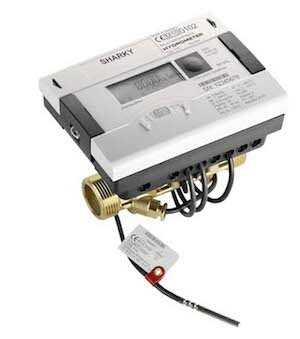 The Sharky 775 ensures residents' heat bills are based on accurate, reliable readings. With the latest measuring principles, the Sharky meter eliminates noise signals and measuring errors giving the meter exceptional accuracy, which in turn, ensures customers can have 100% confidence that their bills will be accurate. Heat meters can also be specified for inclusion within the HIU at the time of manufacture, thus reducing installation costs. We offer a full service, with as much or as little involvement as the client needs. We can sell individual heat meters, with no further involvement, or we can design, supply, install and maintain metering networks and provide billing and Pay As You Go services.